The iPanel is CTC's next-generation touch panel for industrial visualization and interactive control. It combines a rugged, NEMA 4/IP65 all steel and aluminum enclosure with state-of-the-art graphics and networking features and plenty of memory for a no-compromise HMI solution. Move up to an iPanel and get better resolution, better color density, better touchcell density, better connectivity, and a better value. 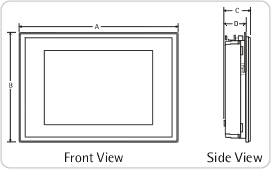 Choose from among five different iPanel models, to fit your needs for size, resolution, and price. 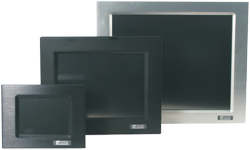 The iPanel features industry-leading resolution and brightness. Select, edit, and run iPanel projects from remote locations. You can even remotely load updated versions of the iPanel firmware over a network server. Thin-client iPanels can be configured to run projects from a central server. A single iPanel can simultaneously interact with a wide variety of different devices, enabling you to access your entire plant operations via a single connection.